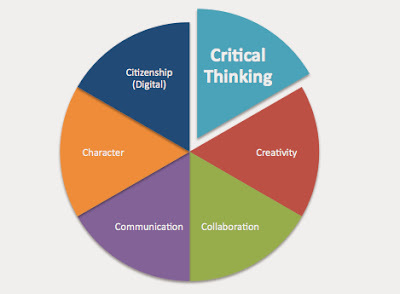 Attempting to define each of the 6 C's of 21st Century Learning has become quite the task. Each C brings with it new questions, insights, and opinions regarding definitions; and how differently we look at it sometimes. This week it was about defining Critical Thinking - a C that for me has become the very large C that fills my classroom everyday. The team has assembled, and the ideas sprung to paper (or computer screens actually). Tina Zita - Critical Thinking = asking questions and responding. "I have only recently begun to consider what critical thinking really means, and have thus shifted my focus on trying to develop this in my students. Up until this point I never really gave it much scrutiny; as I focused on the Knowledge component of students’ learning. I wanted to ensure students ‘knew’ content and could tell me the terms, concepts, and theories. I wanted students to regurgitate studied information and demonstrate to me that they could remember key curriculum components. Why? Well this was what I was taught to be ‘learning’. Only to realize this to be a very erroneous assumption of learning. I was always a curious child growing up - yes that annoying child who constantly asked the ‘Why’ about everything. I wanted to figure out how things work, tearing apart old radios and anything else that could be taken apart to understand the inner workings of things (I never figured it out, I just liked the destruction I think). As well, my elementary teachers couldn’t tell me to do things, without providing a reason first; and if I didn’t like their reasoning, I surely wasn’t about to do what they told me (which more often than not, provided me with a reason to visit the principals office on more than one occasion). However, I lost this somewhere. Somewhere along the way, I stopped asking those questions, and just did what I needed to get by. I believe this is an unfortunate part of our education system; or has traditionally been an unfortunate part. However, I believe the focus is now shifting dramatically away from a concentration on Knowledge, to a much greater focus on a true demonstration of learning. Critical thinking is a much more accurate definition of learning really. The ability to describe ‘Why’ things happen, ‘How’ things happen, and the ‘Impacts’ of world happenings. In the ‘AG’ era (After Google), any student can search terms, concepts, and theories, and define them using their digital devices; but it’s much more difficult for a student to ‘Google’ the ‘How’, ‘Why’, and ‘Impacts’ of world happenings. This is why Critical Thinking is so crucially important. When students are able to critically think, they are able to truly learn about issues, events, concepts, theories, and people from around the world. When students critically think about their own learning, they begin to realize why they perform such actions, create such assessments, and present in such ways. They begin to realize what THEY DO has an impact on the World around them. That to me, is true learning."